Intermittent motion is a traditional and most used technology in the market today. Because of the simplicity, versatility and advanced packaging capabilities of the intermittent motion, it is the preferred option in many applications. Orion Series machines by using Servo-Motion Technology reach the maximum speed that intermittent motion technology could achieve. 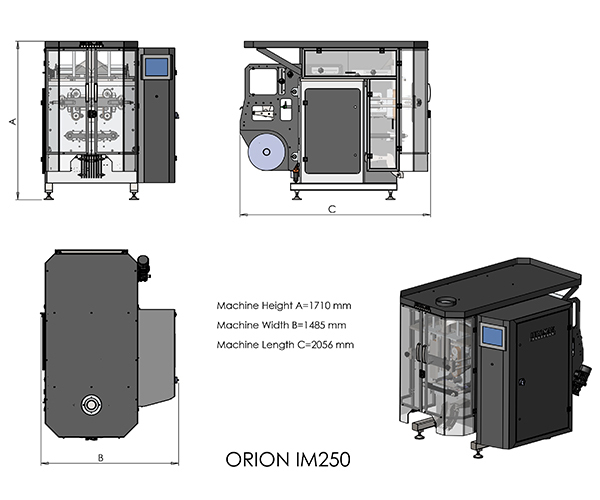 The modular design of Orion Series results in its capability to produce different bag styles and different types all on one machine. 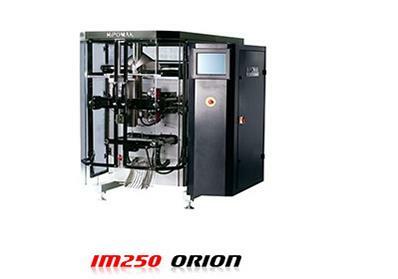 The Orion Series are modular high performance, intermittent motion vertical form, fill, and seal machines for traditional and fragile products Applications. Studied to offer a unique solution for a large range of bag shapes; thanks to the modular design, it can be upgraded at any time with accessories and devices to respond to the ever changing needs of the market. Parts in contact with product in AISI 304 stainless steel. Various Types of Bags, pillow, gusset, block bottom, string bags etc. Main machine movements (horizontal sealing group and film driving group) are driven by means of independent brushless Servo motors. Motion-controller system is only one controller capable of coordinating all the servo motors, all the inputs-outputs, all the control functions of the line, replacing the PLC. 10” LCD Color Touch Screen Panelman-machine interface. Extremely simple and easy to manage all machine parameters. P.I.D Heating Control System provides precision and stable sealing. Film Cut-off is controlled by photo eye on registered film or by incremental encoder on neutral films. Self-Centering Drive Belt controlled by adjustable pneumatic pressure feeds the Film precisely. Auto-Film Centering System adjusts independent roll support to center the film on the tube collar automatically. Out-of-filmSignal with automatic stop of the machine and quick connection between the finished roll and the new roll. Film Tension Sensor indicates sufficient film tension. Movable Roller Arm provides continuous smooth tension for continuous bag forming and registration. Safety is obtained by automatic stop of the machine in case of incorrect closure of the safety doors or operation malfunction, with message on the display Screen. Different Filling Systems adaptable for Multi-head Weigher, Linear Weigher, Volumetric Dosing, Auger Filler, Piston filler etc. Wrapping materials; Polypropylene, laminates and coupled materials in general, barrier film, water-soluble film, film of biological origin, and other heat sealing materials such as polyethylene. Adaptable for different sealing systems such as; impulse sealing, carrier handle bag, easy-open bag, euro-slot bag, round hole bag, string bags, straight cut, tear notch cut, and zig-zag cut. Side Gusseting System for producing squared bottom bags. Air conditioning on the control cabinet. 12” industrial PC man-machine interface. Air Requirement 150 lt/min. 150 lt/min. © 2014 HİPOMAK AMBALAJ MAKİNALARI LTD. ŞTİ. All right reserved.